I’m talking to Ayo Akinsete, general manager of the new Dream Hollywood hotel in Los Angeles, and he’s discussing his hotel’s pool. According to Akinsete, this rooftop oasis holds a secret: With the press of a button, it completely disappears. The system, which was designed by a Canadian company called Akvo Spiralift, uses a series of large pistons to slowly raise the floor of the pool until it is level with the surrounding deck. The process takes about 10 minutes, and requires just a single operator holding down a button “while he listens to a podcast.” As Akinsete mentioned, the Dream Hollywood, which opened in July, is the first location of any sort to feature this system in the US (a claim confirmed by the manufacturer). Of course, the Akvo Spiralift system isn’t just a fun trick: It has the potential to be a real money-maker. According to Akinsete, the system cost the hotel about $250,000 to install—a relatively modest amount in the grand scheme of high-end hotel operations. 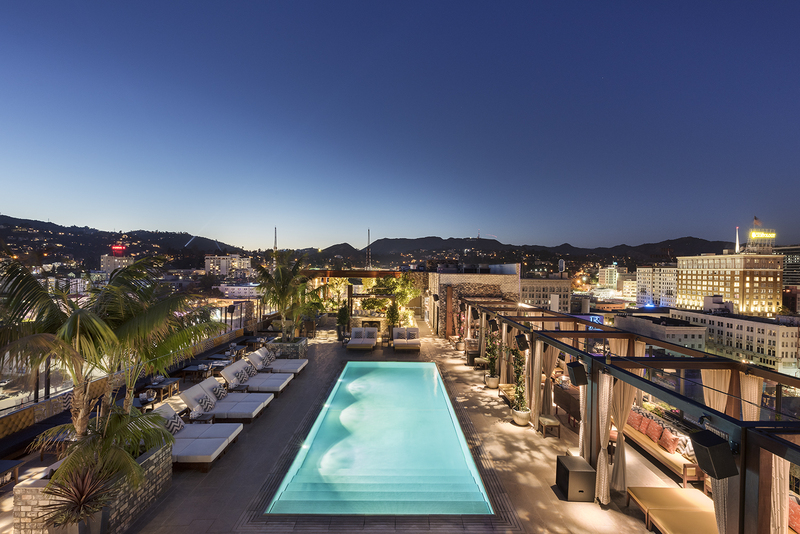 For that money, the hotel gained the ability to turn its rooftop venue, called The Highlight Room, into a flexible event space that can add or reduce floor space without relying on traditional pool-coverage techniques such as tenting. which can cost tens of thousands of dollars per event while requiring a large amount of equipment, manpower, and planning. When the pool is raised, the 11,000-square-foot venue reclaims about 1,000 square-feet of open space, allowing it to raise its capacity from roughly 500 to 700 people. It also allows the venue to utilize large-scale installations that can’t fit on a floorpan that otherwise features narrow spaces that creep around a pool. It also results in countless bewildered guests, who may go off for a drink, only to return to find the swimming pool has vanished. “It’s always a wow moment and you can see their eyes just bulge up,” Akinsete says.